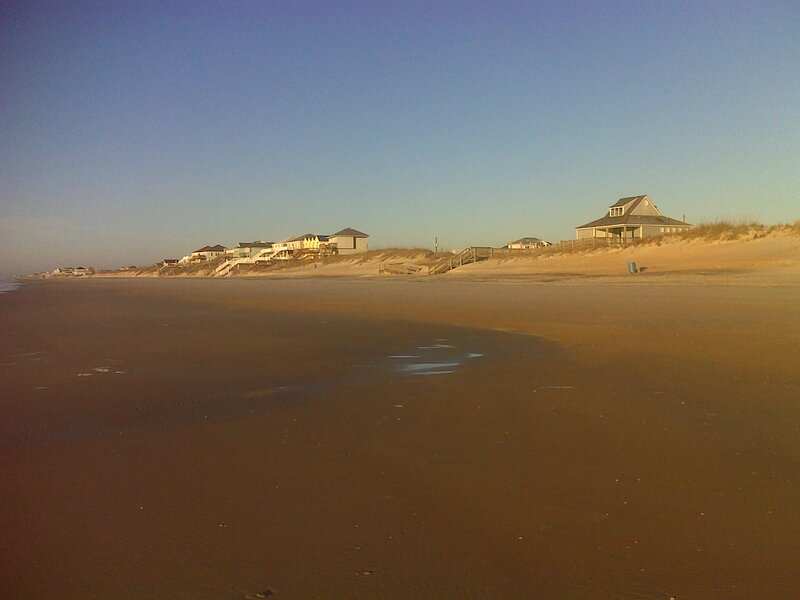 Day 6 of scouting a proposed route for North Carolina's 1000 mile long state park, the Mountains-to-Sea Trail found me walking familiar ground - my 'home beach,' so to speak. The proposed route follows the beach strand for more than eight miles between the two bridges that provide access to the island. 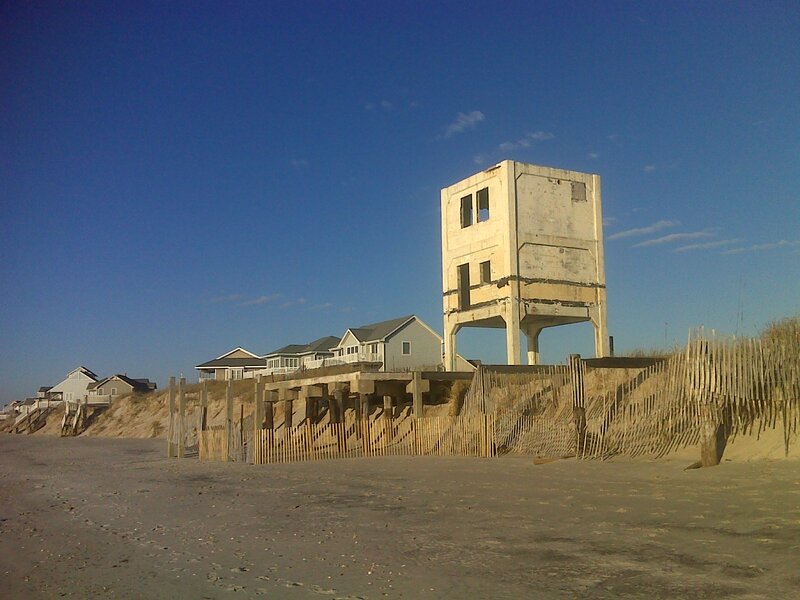 Today I hiked the 6.7 miles of that walk from the Pender-Onslow County line east to where the trail leaves the beach to cross the high bridge on the north end of the island. The highlight of this section of beach is passing one of eight concrete bunker-like rocket observation towers built by the US Navy in 1946 as part of Operation Bumblebee--a rocket testing project that was active on the island for just a year and a half before it was moved elsewhere. 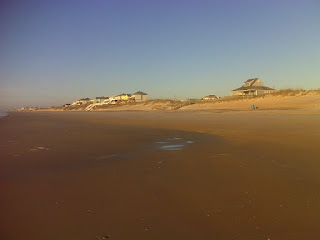 There are several public flush-toilet restrooms along this stretch of beach. Shown at right is the one at a big public park (also with sound access) at Milepost 12. The gray building behind the blue barrel has a water fountain, outdoor showers and rest rooms available year-around. The hiker with a keen eye might find a shark tooth or two amongst the shells and unique quartz pebbles that line the beach. It was a clear crisp day for a hike, and I covered the 13.5 miles (out and back) by 12:30PM then headed back home to my beachfront condo, just four miles from the east end of today's hike. Little wonder that I'd love to see this stretch of beach become part of the Mountains-to-Sea trail. 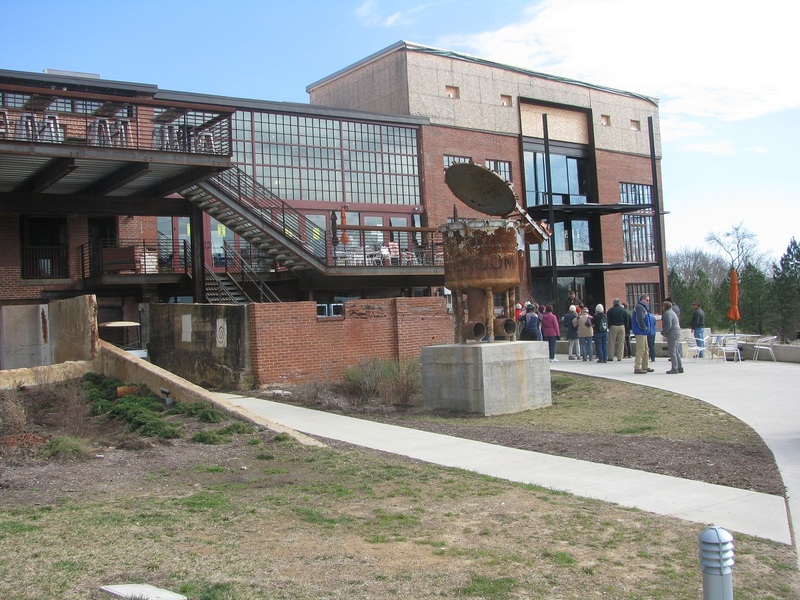 Haw River Ballroom, Saxapahaw, NC, site of the 2013 FMST annual mtg. Last weekend I attended the annual meeting of the Friends of the Mountains-to-Sea Trail at the Haw River Ballroom, along the proposed route of the trail near its middle (between Raleigh and Greensboro) and learned that the trail does not yet have a Master Plan, so its 'identity' remains fluid and subject to change. The proposed hiking route in the eastern coastal plain through the environmentally sensitive and diverse Cape Fear Arch still seems to be competing with the current approved route of the trail along the Neuse River. It's unclear how long it will take before a final decision in this area is made, since both choices for the trail remain largely undeveloped and currently follow roads. It will be fascinating to watch the decision process in coming years.